Hummingbirds love the nectar of Salvias, particularly varieties in red, which they can see but bees can't. Also, unlike most birds, hummingbirds can taste sweets and seek out flowers that produce lots of sugary nectar. However, nectar can be difficult to come by during drought. Flowers that withstand dry conditions and produce plentiful sweet stuff are important. 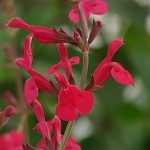 The Salvia genus is well known for its bright flowers, rich nectar and many drought-tolerant plants. We grow lots of hummingbird Salvias at Flowers by the Sea. Here are some hot red favorites for xeric -- low water -- gardens. All are subshrubs, which means they combine some woodiness with soft herbaceous perennial growth. All of these Salvias are great choices for container planting. Three tolerate winter chill (Zones 5 and 6), and all thrive in summer heat. Similar to most sages, none tempt deer. Click on the Salvias A to Z category in the catalog menu at the top of of our homepage. When the new page opens, access the "water needs" section of our product filters in the left margin. Click on "drought resistant" to open a queue of plants requiring the least water. Then try the "average" filter and search for plants that prefer some supplemental watering but may do well during drought. Click on the Salvias by Culture category in the menu bar, then open the "drought tolerant" icon. This will show you the broad range of drought-resistant species. To find our most drought-tolerant species, click on the Blue Tag Xeric Plants category. Be careful not to overwater them. If you have more questions about any of our plants or about gardening during drought and in dry climates, please contact us. We're glad to help you add color, nectar and hummingbirds to your yard.